Distribute to students as a tool for self reflection during and after projects involving problem solving. Reflect on your actions in the classroom, especially regarding behaviour management strategies. Fill in as preparation for job interviews and/or teacher accreditation/tenure portfolio. 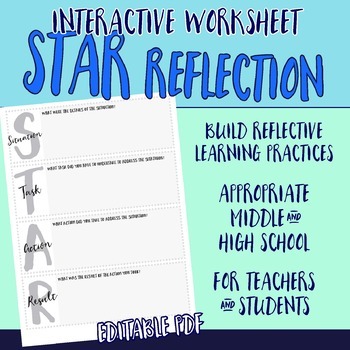 This digital download is an editable PDF or can be used as printable worksheet. I would love to hear your thoughts; please consider leaving feedback below.